AppleInsider readers this week can use discount code Ai10 to knock 10% off their order total at BiteMyApple.co, which brings to market successful, Apple-focused Kickstarter projects. Among them is the Oneadaptr Twist 4 USB World Adapter, available for for $40.49 with after applying the coupon code. 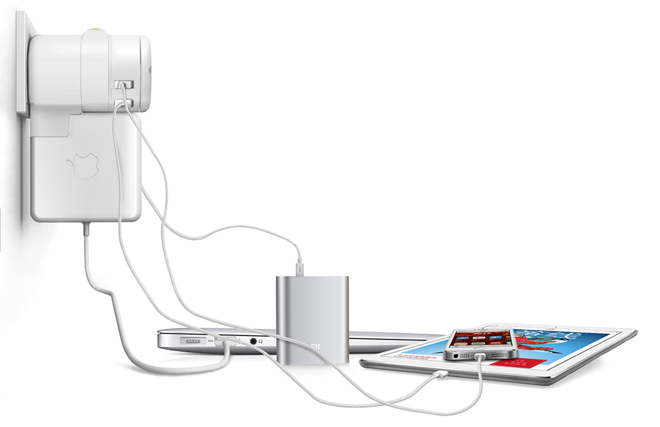 The same model with a MacBook power adapter plug built in (pictured above: watch the video, and use the drop down menu) is due to start shipping in a couple of weeks and is available for $44.99 after Ai10. These are, of course, the lowest prices available for these two new products. Apply the code after clicking the 'Checkout' button. You'll see a link on the right-hand side that says "Have a discount code? Click here to enter it"